Today is a big day for Xbox Music: we’re releasing on iOS and Android and we’re also adding free streaming to our Web player, making Xbox Music and its 30 million tracks available on millions more devices and for free to anyone with a Web browser. Xbox Music is coming up on its one-year anniversary and we’ve learned a lot in that time. Xbox Music is now, more than ever, a service that spans across all kinds of devices—phones, tablets, PCs and TVs—and unites artists with their fans through one common platform. We continue to make milestone achievements in our journey with Xbox Music, positioning us to solve several problems that exist today. A lot of people use multiple music services to get the songs and albums they want. Does this sound familiar? You’re listening to Pandora and bookmark a song you love. Later, you open Spotify and use your subscription to listen to the song over and over again on repeat. And then you use iTunes or Amazon to purchase the song for your own collection that wasn’t available for streaming. We’ve all been there. As a fan of music, I don’t think enjoying the songs I love should be this complicated or disconnected. To solve this problem, last year my team introduced Xbox Music, an all-in-one music service that gives you the independence to stream music for free, subscribe to all the music you want or download to own your favorite songs. And it’s all integrated across your tablet, PC, phone and TV. Since we launched, we’ve done a lot of work to continuously roll out new features and updates. We unveiled new features for Xbox Music on Windows 8, a redesign of the Xbox Music interface in Windows 8.1 and even the first version of a Web-based Xbox Music player earlier this summer. Today, we continue to deliver. 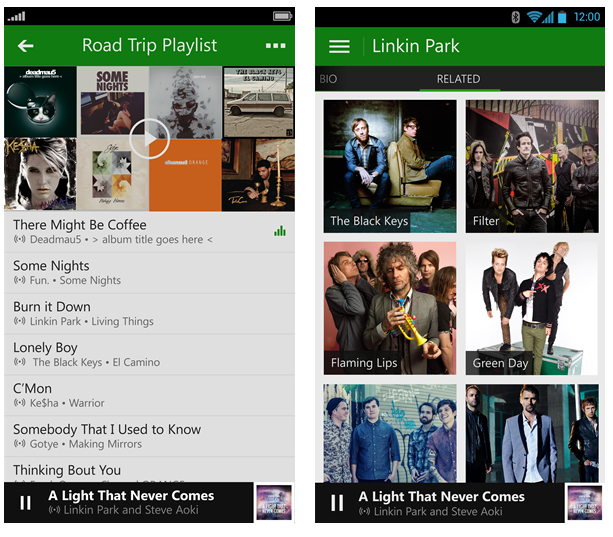 Xbox Music Available on iOS & Android. Xbox Music is now available on iOS and Android devices1 worldwide, expanding the number of devices the service is available on. And this is only the beginning. We’ll continue to improve the service on these platforms bringing offline mode to iOS and Android in the coming months. Free Streaming on any Web Browser Today we’re also releasing an update to our Web-based music player to introduce free streaming on the Web. That means you can simply visit http://music.xbox.com and begin listening to free music immediately. Lets just hope this is only the beginning of Microsoft’s goals of reaching those who primarily use Pandora and Spotify. More importantly, let us hope that Windows Phone users get the same free streaming offered on Windows 8 for their devices as an upgrade to the app with the new Windows Phone 8.1 update slated for early 2014. That would be a phenomenal and welcomed update. Written by: MBGW on September 9, 2013.